The Philadelphia Mummers Parade is as festivals should be: liminal. It is glitzy, garish, bloated, low comic, fluorescent, and like most any city-sponsored holiday celebration, maybe a wee bit nauseating. But best if all- a side that surprised me- the Mummers Parade is, in the best possible sense of the word, faggoty. This was the true source of its liminality, the chance for Philadelphia males to do their thang and don them now their gay apparel. Down Market Street: hordes of Coors-soaked bluecollars and wives with rotisserie-gold tans, who would normally gag at first mention of frilly things, assemble here on this day to march the streets of Central Philly in fluorescent pastel get-ups that would make Liberace blush. 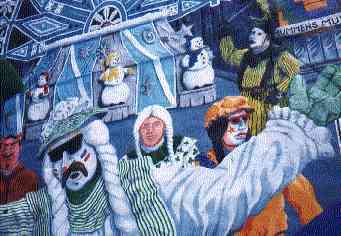 (By the way, in case my tone belies my intentions- this is a wholly affirmative spiel about the mummer corniness, and its swish undertones.) Carpenters and plumbers and candlestick-makers strut their stuff – lifting their skirts, blowing Marilyn Monroe kisses to every possible onlooker, hopping and skipping in Raggedy Anne costumes, sparkling like Bette Midler— the sequins alone, if nothing else, probably make the Mummers Parade the only New Year celebration visible from space. The crowd even hooted and taunted one mummer into a striptease before he was interrupted by police and the unfortunate forces of Decency. After years of evenings afterwork spent doling fives to g-stringed beauties named “Cheyenne” or “Silvia St. Laurent,” it was his turn, his turn on the carousel of publicly-sanctioned role-reversal. Rich snapped shots on his new digital camera: the retarded Planet-of-the-Apes Masks, the homeless gentlemen asking other men for kisses, the peacock costumes, the Clans-of-Scotland frollicking and square dancing and lifting their kilts. Clowns walked around making bad puns. Everything was perfect in its badness.